OK I’m on a bridge. It’s made of metal and looks to be a couple of hundred metres long. So it’s an English-speaking country. The snow on the mountains rules out South Africa, I think, and this is definitely not the UK or Ireland. Head west along the highway. Speed limit sign indicates 30 KM/H. So it’s not the USA. Sign: Hazelton 2. Gas, Food, Lodging, Camping, Tourist attraction. I’ve got a suspicion that this might be Tasmania. The vegetation would fit, I think. Maybe New Zealand but I don’t know for sure that they use metric distance measures there. They probably do. Hmm. Continuing northwest along the highway, there’s a commercial building, white with a blue roof, and another road sign in the distance. Also, a pcik-up truck. They’re popular in Australia but I’m now realizing how little I know about New Zealand. The building is a garage. The sign says Two Mile Services. So we’re two miles from something. And that despite the kilometres on the road sign. Hey, are they metric in Canada? I see more pick-up trucks in the parking lot and on the hill behind, a large and quite brashly designed house. Or a small modern church, not sure which. The entrance to Two Mile Services says Auto Parts. I can’t make out any markings or bank logos on the door, so it’s no help. I’ve just noticed a U-Haul trailer in the parking lot. Not sure how relevant that is. But maybe this is North America after all. Another sign that says 2-Mile and then something illegible beneath. The sign’s illustrated with a picture of a man trying to drag a mule into action. There are some boats covered with tarpaulin in a yard nearby, so we’re close to a lake or the sea. Probably. Sign: Silver Standard Rd (or Rt?) Ahead. Coupled with the mule, this sounds like mining country. Ah, now here’s Silver Standard Rd and some sort of Adventist church, and the Triple Creek Ranch B&B. Ando now a sign that reads Suu Dee’s Local something or other. Not helpful, Suu Dee. Not cool. A truck in a lot on the side of the road gives me a big clue. E.W.J. 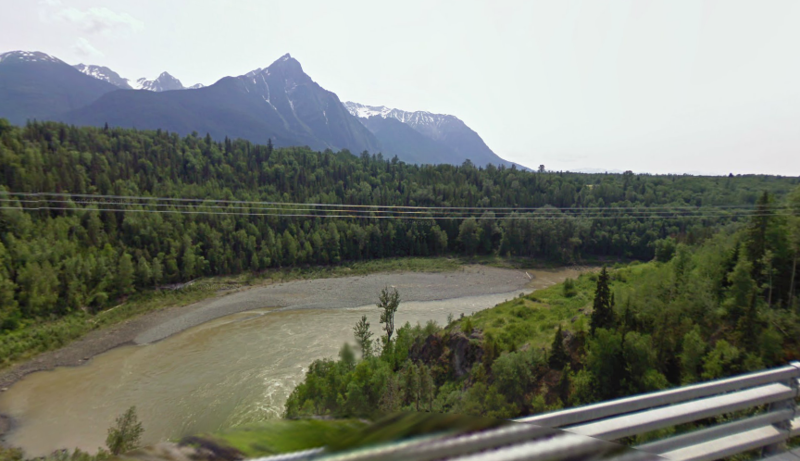 Kendall – Highway 63 – Hazelton B.C. So we’re in Canada. British Columbia. Near Hazelton possibly on Highway 63, north of some pretty big and spiky mountains. Possibly near water. Sign: Welcome to Historic Hazelton – Founded in 1866. Elevation 720ft 220M. I guess Canda must have gone metric some time in living memory. Sign: Gitanmaax/Hazelton Reservoir. Please protect your water. But where is Hazelton? And where’s Highway 63? I can find 93 but that’s no use. Hazelton village is on a river. And it has a pleasant little riverboat on the bank which is used as a pizzeria. So not a lake. And not the sea. Back to my starting point and heading East to get a better picture. I was being followed by a police car! Sign: Hitchhiking – Is it worth the risk? Aha! Found another highway route sign: Route 16 East- West. Back to the guessing map. For about 15 minutes. I follow Route 16 for hundreds of miles and suddenly: Hazelton! Look for the right road… look for the bridge… GUESS. 6.12 KM away. Damn. Still, I feel like I’ve learned a lot about Hazelton, British Columbia and Canada during this short trip. Thanks, GeoGuessr!